Melbourne: Former Australian Skipper Ricky Ponting has vouched for Alex Carey and said the latter was capable of filling in as captain if Aaron Finch due to some reason becomes unavailable. "I actually think he's got really good strong leadership qualities as well. 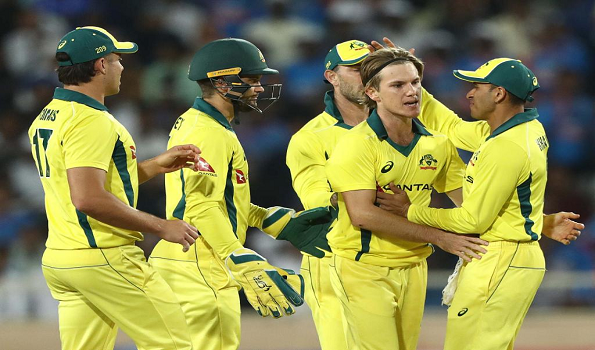 "If anything happened to Finch through the World Cup or leading into the World Cup, then I think he's really well-equipped to lead the side, even though he's still relatively inexperienced and never captained Australia before,'' cricket.com.au quoted Ponting as saying. The 27-year-old is in the box seat to take the gloves at this year's World Cup after confident performances abroad against India and Pakistan, making his maiden ODI half-century at No 7 in the fourth ODI in Dubai while his glovework too remaining sharp throughout. "Alex Carey offers the best package as keeper," he said. "He's dangerous at the top of the order or late in the innings because he does score 360 degrees, he's a deceptively hard hitter of the ball and for mine, he's just the right character, he's the right person that you want to have in your team,'' Ponting further added. Carey's path to the national team has been far from conventional, having been rejected by professional teams in two different sporting codes before beginning his rapid ascent.With that in mind, Carey is conscious of nailing his spot down in Australia's one-day team and not worrying about his own leadership ambitions. "I'd like to be at the World Cup first. We've got lots of leaders around this group." cricket.com.au quoted the 27-year-old as saying. "Usman Khawaja is playing some really good cricket and he's taken his game and his leadership to the next level. "(Fellow vice-captain) Pat Cummins is another one who has lots of respect around the group. We've got lots of guys. Hopefully Finchy (skipper Aaron Finch) is fine and stays on the park and don't have to worry about that one." Test skipper Tim Paine and Matthew Wade, as well part-time gloveman Peter Handscomb were others players named by Selection chief Trevor Hohns for keeping options in the tournament. But Ponting believes Australia have left it too late to switch glovemen and suggested Carey's extended run in the ODI side over the summer reflects a preference to have him behind the stumps for their 50-over title defence. "I think it's too late now to be making those changes on your keeper," Ponting continued.